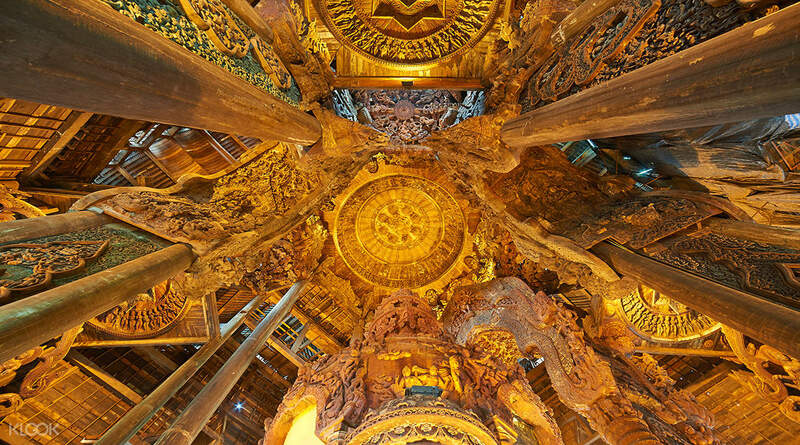 The Sanctuary of Truth is an architecture marvel composed entirely of wood without any metal nails. 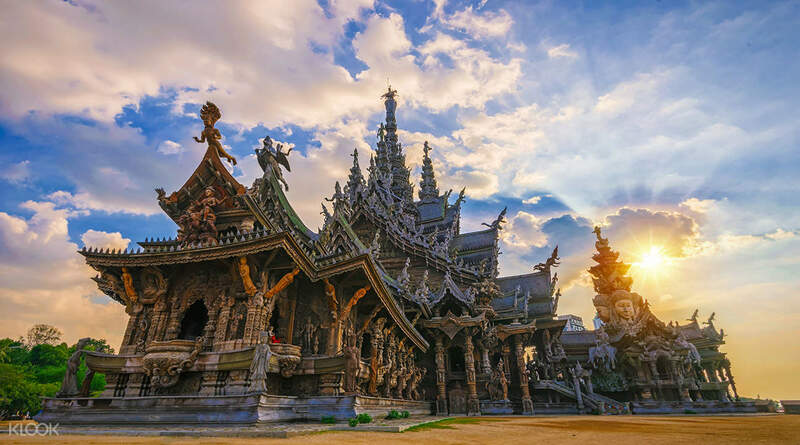 Constructed to preserve the building techniques of the past, the building exemplifies hand-hewn woodworking skills in Thailand. Built based on the religious philosophy of impermanence, the complex features four wings dedicated to Thai, Khmer, Chinese and Indian religious iconography respectively. Check out the intricate wooden carvings as you walk around the building. The location was scenic. It was so artistic inside that I had no words to describe. Not crowded at all on the day we went. What imagination the person who created this had!! Wow... for me it's a must visit. while we were there Lord Ganesha bhajans in Hindi and Tamil were being played. One has to see it to realise its beauty. The return taxi from this place is expensive and theres no choice. The location was scenic. It was so artistic inside that I had no words to describe. Not crowded at all on the day we went. What imagination the person who created this had!! Wow... for me it's a must visit. while we were there Lord Ganesha bhajans in Hindi and Tamil were being played. One has to see it to realise its beauty. The return taxi from this place is expensive and theres no choice. It was wonderdul experience to be there. Booking from klook was great, got tickets at best cheap rate, hassle free. Enjoyed short Thai cultural show. Temple just located by the sea, made of wooden is fasinating. Both Interior & exrerior designs definitely attract your eyes. One of the must visit place when you are in Pattaya. It was wonderdul experience to be there. Booking from klook was great, got tickets at best cheap rate, hassle free. Enjoyed short Thai cultural show. Temple just located by the sea, made of wooden is fasinating. Both Interior & exrerior designs definitely attract your eyes. One of the must visit place when you are in Pattaya. Sanctuary of Truth is amazing temple and a must see in Pattaya. The temple complex is itself very beautiful and offers amazing views. we booked the entrance ticket with Klook and had quick ticket redemption against the voucher and had a great memorable time. Sanctuary of Truth is amazing temple and a must see in Pattaya. The temple complex is itself very beautiful and offers amazing views. we booked the entrance ticket with Klook and had quick ticket redemption against the voucher and had a great memorable time. This place is so beautiful as it was situated near the sea. The wooden sculptues and carvings were so amazing. Wonder how much time it took to do all those great carvings. We were able to worship relics of Lord Buddha inside the temple. It was so peaceful. This is a must see place if you visit to pattaya. This place is so beautiful as it was situated near the sea. The wooden sculptues and carvings were so amazing. Wonder how much time it took to do all those great carvings. We were able to worship relics of Lord Buddha inside the temple. It was so peaceful. This is a must see place if you visit to pattaya. We were able to book this activity a night before we went to the sanctuary. It was easy to redeem since they have a separate booth for coupons/online bookings. We really enjoyed it and the sanctuary was surreal! We were able to book this activity a night before we went to the sanctuary. It was easy to redeem since they have a separate booth for coupons/online bookings. We really enjoyed it and the sanctuary was surreal!